Even as we pray for Shane and The Simple Way, and their damaged, Kensington neighborhood, (and please do follow the link I gave yesterday to consider making some donation to ease the plight from their awful fire) we continue on. I am leaving to speak at a conference—co-facilitate a conversation at a retreat is a better way of describing our hope—at Gordon College, north of Boston. The excellent chaplain there is a good friend, and he’s invited a group of alumni from that college to gather (some of them more than a decade out of school) and reflect on their sense of vocation, the ways they are or are not holding on to a coherent vision of the faith that relates to all of life. Of course we trust that they have a mature spiritual life and are active in a local congregation, and hope they will share about such matters. But more, we want to create a safe and energizing space for them to give voice to their deepest yearnings about meaning, purpose, the integration of faith and work and the ways their education (years ago, perhaps) has influenced them as they discern vocational calls and professional stations in ways that are worthy of the name Christian. My friend sent out some very good excerpts from a few books to them in advance and we will talk about others writings, too. Steve Garber will be joining us, which affords me yet another time to tell of the expanded edition of his Fabric of Faithfulness: Weaving Together Belief and Behavior (IVP; $14) which is an astonishing book, ideal for the sorts of conversations we hope to have at this little retreat. And, of course, I’ll recommend bunches of resources and tell some booksellin’ stories. 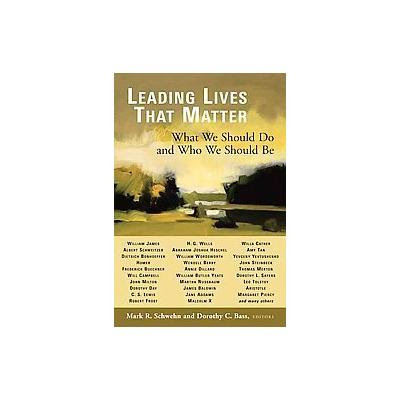 Leading Lives That Matter: What We Should Do and Who We Should Be edited by Mark Schwehn and Dorothy Bass (Eerdmans; $24 .) 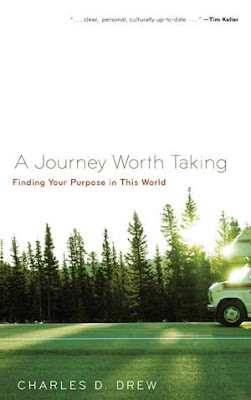 With pieces as diverse as Frederick Buechner and Dorothy Day and Mark Twain and Dorothy Sayers, coupled with thoughtful introductions and questions, this literary reader is a great book to dip in to anytime the spirit flags and you need a thoughtful reminder of why you do what you do. Why do you do what you do? Does it matter? I’d bet that many of our readers know Parker’s Palmer’s lovely little reflection, Let Your Life Speak: Listening for the Voice of Vocation (Jossey-Bass; $18.95). Again, that is the kind of thing we will be recommending, hoping to generation conversations about listening well, attending to our lives, discerning together ways to live life fully, exalting Christ, making a difference, finding, somehow, joy through it all. Will you pray for us? Think about these things yourselves? Get these kind of books better known, as resources for churches or fellowships or schools or Bible groups that tend not to ask these kinds of questions, or use these kinds of resources? It is what we are about, here at Hearts & Minds. Thanks for being a part! Byron, are you really here? If it wouldn’t push you over the edge of social exhaustion, tell me when I might catch you for a quick hello, and I’ll come find you. I’d be so encouraged just to say hi to you– it’s been a year and a half! And quite a year and a half. Again, Byron, so good to see you. I look forward to the next excuse. Get all those family members well. Thanks for this. It’s always good to hear of new and exciting books on calling and vocation. The evangelical church in the 21st Century needs to move into a holistic approach to vocation – beyond the dualism of “sacred life” (worship at church / prayer / evangelism / serving in the church) and “secular life” (my job / my hobbies / just about everything I do besides go to church).